You might say that I have an affinity to the City of Angels. You see, I was named after the town by the banks of the puny river grandly named Nuestra Senora de Los Angeles de Porciuncula. My folks were stranded in Los Angeles on their way back home to China when a wire from my grandparents advised them to stay put as Pearl Harbor had just been bombed and it wasn't safe for them to travel. Dad and Mom made a lot of friends here among the Chinese students at the University of Southern California, and they loved the City so much, they named their firstborn after Los Angeles. Lucky for me that weren't marooned in Tallahassee! The Chinese have been in Los Angeles area since 1852 and were involved heavily into the development of the agriculture, seafood, and railroad industries in the early days. Their communities in Redlands and Riverside were built according to the laws of feng shui, the Chinese environmental art of placement, evidenced in the layout of the streets and buildings. But their town was not unique, because the settlers were only bringing old traditions to their new home, for feng shui has been practiced by all classes from the emperor down to the villager throughout China for centuries. In recent years, "wind water," as it is translated, has captured the interest and imagination of millions worldwide, and entering the mainstream in bookstores, print and broadcast media, residential and commercial development, and in social and personal ways. Dynamic, cosmopolitan, and forward-thinking Los Angeles, capital of the entertainment, tourism, and manufacturing industries as well as gateway to the Pacific, makes a fascinating feng shui case study, a classic example of the yin and yang. Feng shui is one of the five pillars of our destiny according to the Chinese. Fate, luck, charity and philanthropy, and education are the other four. 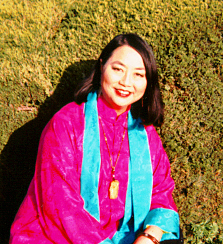 The flow of beneficial cosmic energy called chi, the balance of yin (dark, soft, female, passive, nurturing) and yang (bright, hard, male, active, aggressive), and the interaction of the elements are the foundation for placement as well as all aspects of traditional Chinese medicine, including tai chi, chi gong, accupuncture, and accupressure. Each of the eight compass points are associated with different aspects of our lives and anyone can activate or improve them by using colors, numbers, symbols, and elements. To evaluate any land for good feng shui attributes, the flow of energy, yin and yang, the elements, the shape of the land, the natural flora and fauna, historical and spiritual events that have occurred, and last but not least, the man-made structures must be considered. Los Angeles is situated at the east end of the Santa Monica Mountains which originate at the Pacific Ocean south of Malibu and at the coast by Pacific Palisades. The City in the late 1800s was a rip-roaring wild West town and the Plaza area at the base of Elysian Heights where Dodger Stadium is now located, was where the multicultural ethnic community grew and where a riot and massacre of 18 Chinese took place in October 1871. South to and past the site of an ancient Indian and the Chinese burial ground is where the city began to grow and the mansions of the affluent sprang up in the neighborhood of USC. Because there are not many hills, residences of the City's elite in the 1920s and 1930s moved from the Adams area near to the West. During heyday of the railroad, publishing, oil and silent film industries, many of the City's and nation's great names resided in Beverly Hills, Holmby Hills, and Bel-Air: Edward Doheny, Randolph Hearst, Gloria Swanson, Charlie Chaplin, Mary Pickford, Douglas Fairbanks, Johnny Weismuller, George and Ira Gershwin, and Rudolph Valentino. To this day, their mansions are still owned by contemporary giants in media, entertainment, business, and industry: Aaron Spelling, Hugh Hefner, Peter Falk, Elizabeth Taylor, Michael Eisner, Lee Iacocca, Quincy Jones, Neil Diamond, Danny DeVito, and Sharon Stone. The roster that continues is nothing if not the A-list of the rich and famous in their respective areas of endeavor. Connect the high-income areas of Malibu, San Marino, and the Palos Verdes Peninsula, and a hidden, golden triangle of power, influence, and wealth is revealed. Where there is little water as in Los Angeles, roads become the symbolic waterways, conduits of trade and commerce, and therefore prosperity. These roads, like waterways, were originally cattle roads of the great ranchos, or wagon roads that brought new settlers and their needs to the West. Crisscrossing the basin is a dynamic network of freeways, transporting traffic, people, and goods across the Southland from around the country and the globe. Moreover, because the city is located, like most major metropolitan areas of the world, next to a body of water, e.g., river, lake or ocean, it attracts the beneficial cosmic energy called chi. Notice that that the wealthiest zip code in the country is 90274 belongs to Palos Verdes, not Beverly Hills, is on a peninsula surrounded by water. Others are in Malibu and the affluent areas of Laguna and Newport Beaches in Orange County. Truly the Southland enjoys the classic benefits of good wind (feng) in its awesome ocean breezes and water (shui) with its proximity to the Pacific Ocean.